"Excellent with breakfast, lunch or dinner. For breakfast, I serve it with fried eggs, butter, warm syrup, and jam sauce"
Preheat oven to 375 degrees F (190 degrees C). Grease a 9x5 inch loaf pan. In a large bowl, mix together corn, sour cream, eggs and melted butter. Gradually stir in the cornmeal, sugar and applesauce. Pour into the prepared pan. Bake at 375 degrees F (190 degrees C) for 25 minutes, or until a toothpick inserted into the center of the loaf comes out clean. See the accidentally best cornbread dressing ever. I Love this recipe! Very Good. Ummmm! Cooked for our company dinner. 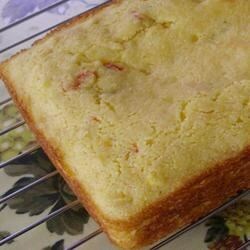 A very easy recipe for someone like myself who had never made cornbread. I only had half a cup of sour cream but the bread still came out very moist. I did not care for this recipe. It is missing a key ingredient. This is outstanding! I needed a good cornbread for a chili party I threw...Everyone loved the cornbread. Thanks.